I’ve been trying to find out more about our little river recently. Where does it start, where does it go and most of all, what is it called? It’s a lovely little river with seemingly more wildlife every year. Baby moorhens were spotted last week and in the past I’ve seen ducks living on it and little fish swimming in the various pools. There’s a kingfisher nearby, water voles have been spotted on it’s banks and there are countless insects and birds. As well as being a great asset for wildlife, it’s also a fantastic amenity for us. I’ve often stood and watched it with my daughter, played pooh sticks and gathered brambles from it’s banks. on maps and aerial photographs, but I have yet to find any – including fluvial maps – that name the river. But I think it’s probably the South Norwood Stream. 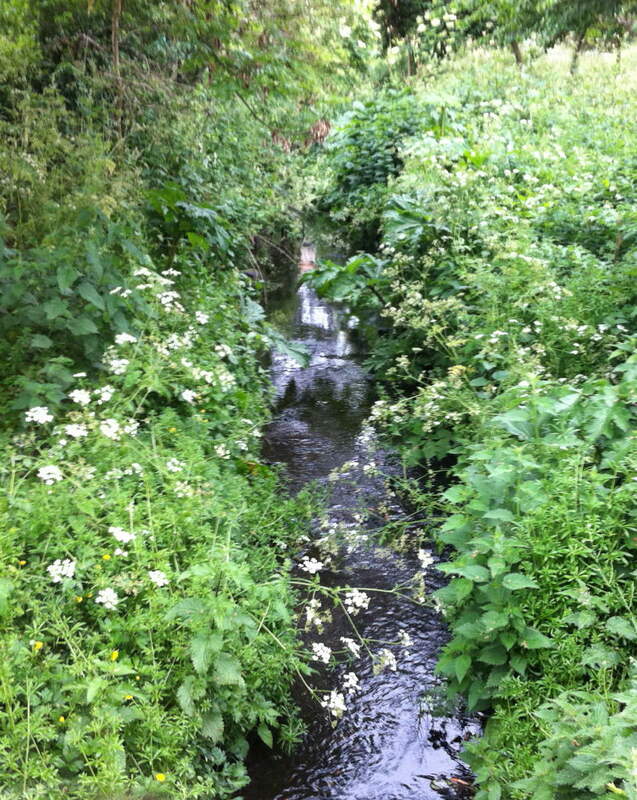 I know it flows through (or starts) in South Norwood Country Park. What I find amazing is that our little river eventually flows into the Thames at Deptford Creek. Before that it joins firstly with the Chaffinch Brook at Clockhouse Road, then joins the River Beck to form the Pool River. 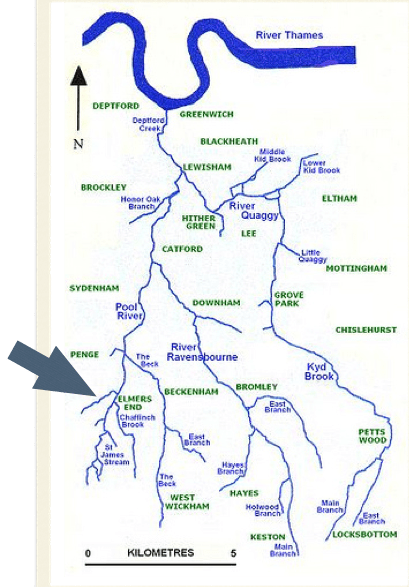 The Pool River joins the Ravensbourne at Catford Bridge and then the Quaggy at Lewisham. The map slows the river catchment. Hi Jeanette, I can’t provide you with a clear answer for this, but based on contours in South Norwood Country Park it looks like it may have been shifted a bit over the years by developments. It looks as though it may have run directly through the lake in the park which earliest known name is ‘la motes’ meaning the moat, which would have likely have been damned and landscaped back when it used to be part of a estate. I’m doing quite a lot of work on habitat mapping of London’s native environments. Unfortunately i’m not really looking south of Crystal Palace at the moment or I would be able to undertake more research for you. But finding the lost names of rivers and forests has become something of an obsession. Thanks for the information. I will definitely look into that. Good luck habitat mapping! Next PostNext Drowning in courgettes? Too many Peas to Pod?